Phil Taylor relaxed in Townsville ahead of the Pro Darts Series. 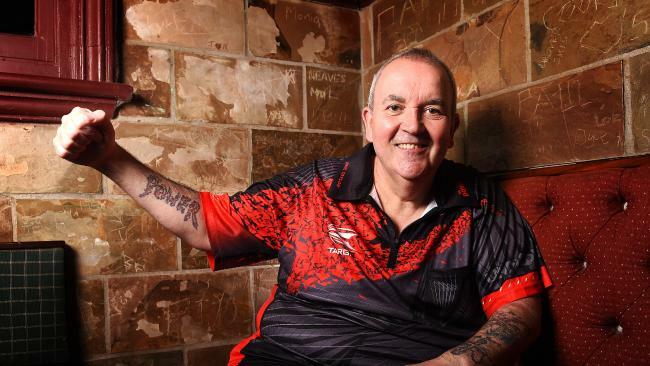 That has been the buzz word for Phil 'The Power' Taylor over the past month as the inaugural International Pro Darts Showdown Series toured around Queensland. After 30 years of being under pressure on and off the darts oche, the man from Stoke-on-Trent has finally been able to take things a little bit easier, throw a few darts and most of all enjoy the Sunshine State. Taylor just missed out on a 17th title when he lost to Rob Cross in the final of the world championship at London's Alexandra Palace on New Year's Day. That signalled his retirement from the Professional Darts Corporation Tour and a professional career. The 57-year-old has done it all in darts and sometimes felt the strain of being the man to be shot at, so to speak, but when I spoke to him in the more humble surroundings of the players' rooms on the first night of the Mackay leg of series at Mackay Entertainment and Convention Centre, Taylor was having a laugh and a joke, and had a smile that would have been difficult to knock off for the next 10 years. For the first time in his extraordinary career, during which he won an amazing 216 professional tournaments, including 83 major titles and 16 world championships, it wasn't all about him and he has loved every minute of it. "It's been great, especially the weather," Taylor said. "Everyone back home has the flu and it's cold. My son is in hospital at the moment with the flu. It's crazy and we are out here and it's golden sunshine." Taylor was the headline act for the month-long Pro Darts series which landed in Brisbane, Gold Coast, Townsville and Mackay. The champion was joined on the tour of Queensland, which was put together by News Corp, by Australia's No.2 Simon Whitlock for the first two events before he had to head back to England because of PDC commitments. World junior champion Dimitri Van den Bergh came over for the final two tournaments in place of Whitlock, with fellow professionals or ex-professionals Kyle Anderson, Devon Petersen, Andy Hamilton, John Kuzcinski, Russell Stewart and Jamie Harvey here for the month. Taylor said if 10 years ago someone had suggested he would have spent a month Down Under having the time of his life he would not have laughed them off. "Of course I would. You would think you'd fallen off a Christmas tree and hit every branch on the way down," he said. "It's been fantastic. Mark (Algie, director events and custom media) and News Corp have looked after me tremendously, they really have, and I would say this in all honesty because if I didn't I would tell you, I have loved every minute of it. "It's nice to see the players with a big smile on their faces as well. The qualifiers, the people coming through. "In Mackay, I played a young lad from Cork in Ireland (Kevin McCarthy) who I played when he was 16 and I have not played him again since. "News Corp has given everyone a chance to meet the people they have seen on the TV and sample the atmosphere and to see what it's like to be at a professional match." During the tournament, players picked up points for their performances, and fittingly the series ended in a tie with Taylor and Anderson sharing the trophy on 60 points. In a gesture which summed up his more relaxed persona, Taylor said Anderson deserved to keep the inaugural trophy as he had performed better. Taylor lost in the Gold Coast semi-finals to Anderson before Brisbane qualifier Raymond Smith provided the shock of the tournament in their last-four clash in Mackay. Both those results would have hurt Taylor's professional pride but as explained, not as much as it would have done before his retirement. "To be honest I still feel the pressure of winning especially when there's a large crowd," he told me. "That's your nature - that's the nature of the beast - you want to win. "It's like if you go into a gymnasium you want to be best there even though you can't. You want to be the best at everything, that's just the way we are. "(But now) It's great just to think 'if I do win, I win, if I lose it's not the end of the world now, it's not going to be plastered all over the front pages of The Sun any more. "I am the kind of person, I think there is a few in sport who are like me, where it wouldn't matter if you were playing for a million pounds or 10 pounds, the game's the game and you play to win. Simple as that and that's life too. "It's the same in business - if you were a pub landlord or own a sandwich shop - you want to be the best there is. "Sometime my grandkids will say 'did you let me win granddad' - trust me I did not let you win. "I am the world's worst for not letting people win. "If you win you beat me fair and square." Taylor said the past month, where he was able to spend time with partner Karen and his ever-faithful manager Bob Glenn, had been the perfect way to begin his retirement. "It's been the best thing since sliced bread," he said. "It's got me out the UK for five or six weeks because I am going to New Zealand after this. "We have got lovely sunny weather I have missed all the flu and bugs flying about at home. "It's a chance for me to come and meet people that I have not seen before and spend time with people. "When you are at major tournaments you don't spend time with the fans. "You don't see the people who actually pay your wages if that makes sense, the people that support you, the people that watch the game on Fox Sports and have to get up at 4am in Australia. "I didn't realise the darts was on here at 4am and people are getting up at 2am to get ready and they have to go to work after the darts, it's fantastic." Taylor said organisers and sponsors should be proud of how the first International Pro Darts Showdown Series went. "I think it's taken off OK," Taylor said. "I think you will be 75per cent happy but I think if you carry on it will be 100per cent happy. "I think it will just grow and grow, I do." Taylor was hoping that the new tournament would encourage others to take up the sport of darts and he had been happy to spread the word. "Not everybody can be an athlete," he said. "In Australia they play more outdoor sports with the weather the way it is but there are people that can't do that. "So there will be people that want to play darts because they can and they can't run 100 metres in 10 seconds." 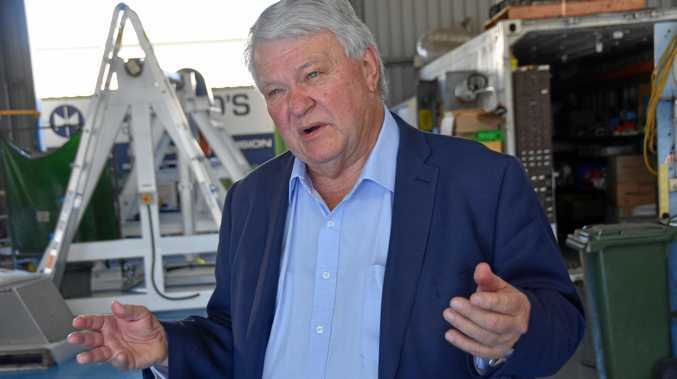 The likes of Smith, who defeated Taylor in Mackay, Robbie King, Lucas Cameron, Tic Bridge, Rhys Mathewson and Gordon G Mathers had impressed the 16-time world champ and he said the future of darts Down Under was in good hands. "I think the standard is very good," he said. "I think there are players who haven't played to their true potential yet. "What it's like in depth I don't know but I can only judge the players I have seen but there are some good players." I asked Taylor at the end of the interview whether he would like to come back if News Corp were to hold more Pro Darts series. "I will have to think about it ... for about four seconds," he laughed. "If you didn't enjoy yourself then you are an idiot to be quite honest, it's spectacular. "We have been from Brisbane to the Gold Coast to Townsville to Vanautu (for an exhibition), which was mind-blowing, and then we come to Mackay which is also a lovely little place." Taylor loved his time in Australia so much, he is even thinking of moving out full time. "In a heartbeat," he replied when I asked him if he would like to live here. "For me personally, this (Mackay) would be the place I would pick, plus Townsville," he said. "They are my types of town where it's nice and quiet."